« Lemon yogurt soap for fresh morning! The winter is behind the door, the weather is rainy, windy and cold. A real challenge for our skin. Soon, there will be snow and we will go skiing and there will be a lot of sun. One more reason to make a protective winter facial cream. 1 How to design a winter facial cream? How to design a winter facial cream? A protective facial cream should be greasy enough to make a layer protecting from cold and wind – therefore I designed a recipe with 50% of oils. Such a high proportion of oils allows us to use only lecithin and beeswax as emulsifiers, which makes the cream very natural. [A side note: Although not considered a real emulsifier, beeswax is a co-emulsifier and helps stabilize emulsions. At least this is what I have read in books on cosmetics formulations. It is also a main emulsifier in cold creams – creams with high proportion of oils. From my experience, it works well for creams with high proportion of oils, although such an emulsion is difficult to make and may need a very intense mixing – which means that the physical emulsification plays a big role in creating the emulsion. We want the oil to have skin repairing properties. Avocado and macadamia nut oil are the ideal candidates for our purpose. Avocado oil thanks to its high phytosterol content is used in cosmetics as a skin repairing, moisturizing oil that regenerates skin cells and is used in anti-aging creams and creams for sensitive and dry skin. I had at home avocado butter, which is pretty much the same thing as oil, just that it was mixed with some hydrogenated vegetable oil to make it butter. Macadamia oil – similarly to avocado butter is used in anti-wrinkle creams and is skin regenerating. Is a bit less greasy than avocado oil. Both oils have mild sunscreen properties. For the water phase, I decided to use rose water. First, it smells nice, second it has some nice, skin calming properties. I will elaborate on all ingredients more in detail in some of my future posts. The recipe was similar to my Maringold hand protection cream , just in this case I hand stirred the recipe – yes, it is possible! 3. Heat the rose water with soaked lecithin to 70°C (158°F). 4. Slowly pour the oil phase to the rose water with lecithin and stir until emulsion takes place. It is important to stir until the emulsion reaches room temperature – mainly when hand stirring! Emulsifying with beeswax and lecithin can be tricky and requires much of physical stirring. This gives around two small 50g (1.8.oz) containers. I tried this recipe last year when snowshoeing – I applied the cream before leaving the house on me and my fiancé. Results – 5 hours from 12:00PM to 5 PM snowshoeing on the snow planes, full sun. My skin was not burned, I felt it very nice and felt protected. I loved it! PS: Do you like my recipe? What is your experience with lecithin and beeswax as emulsifiers? Leave me your the comments below, I will be happy to read it! This entry was posted by evik on November 14, 2012 at 00:19, and is filed under face. Follow any responses to this post through RSS 2.0.You can leave a response or trackback from your own site. That’s a great idea for winter (and Christmas present), however I have a mixed oily skin, do you think I could use it even with a 50% fat phase? If your skin is oily you can try just adding a few drops of lavender essential oil which helps to balance skin weather oily or dry. Thanks for this recipe. I’ve been looking online for a recipe using lecithin as an emulsifier. I am going to use this as the base for making a cream for my 12 month old who has very dry skin prone to eczema. I’ll keep the proportions the same but will use jojoba oil, shea butter, raspberry seed oil and carrot seed oil (CO2 extract). I’ll also use aloe vera gel in place of the rose water. We live in Australia and raspberry and carrot seed oil are reputed to be very effective sunscreens. I’ll let you know how it turns out. Oh and i’ll also add a few drops of myrrh essential oil which is meant to be anti inflammatory, antioxidant and also have sunscreen properties. Is it possible to make your own avocado butter? I have avocado oil which is homemade. Hi Piera, hummm, if you substitute coconut butter for both avocado and macadamia, it might be thick enough only with lecithin. Did you try? Did it work? Please, let me know. 1. What do you use for a preservative? 2. I want to use sunflower lecithin in liquid form. Do you have any idea how to make the adjustment? know I have to add about 30% more to adjust for the oil, but I prefer to use it because it is nonGMO and I want to stay away from soy anythng. What phase would I add? 2. I would use it in the oil phase! Thank you for your post. I’ve seen numerous information that lecithin does not work as an emulsifier, but you seem to prove the opposite. Could you tell me if the creams made with lecithin and beeswax separated for your within a week or so? Thank you again. Hi Alex, it did not separate. If I may cite a scientific paper here: “Lecithin is a known antioxidant compound (Evans, 1935, Feigenbaum, 1946 and Judde et al., 2003) with good emulsification properties” (http://www.sciencedirect.com/science/article/pii/S0378517313003396). I have more tests to do, but what I can confirm is that it emulsifies nicely emulsions with 30% of oils. The emulsion is liquid milk, therefore it must be combined with gums or waxes (beeswax, etc…), or fatty alcohols to make it cream. I can tell that it does not work for 5 or 15% oils. They say it should work with 5% of oils, too, but it did not work for me, but I am not sure if I used the same procedure (warm vs cold emulsion). thankyou very much for these wonderful recipes, I live in Australia. I will be making many more of your fabulous recipes. what grapefruit seed extract have you found that actually works? I noticed you said “not all of them work”. Do you think rosemary co2 extract could work simarlily? would optiphen plus work in this recipe? I see companies that sell creams with no presercatives, with no fragrances or frangrance oils to hide the preservative. I look through the ingrdients thoroughly and can find no preservatives and I want to know how they do it! Otherwise I suppose ill use optiphen. id also like to experiment with aborcide. you can try 40% water, however, it gets more difficult to make stable emulsion (as to my experience). But with lecithin, that should be fine. Hello it is difficult lets say imposible to get cosgard or other Ecocert approved preservative, do you have any experiencia with potassium sorbate and sodium benzoate? I finally got around to trying this recipe. You seem to be the only one posting how to get the lecithin granules to dissolve. 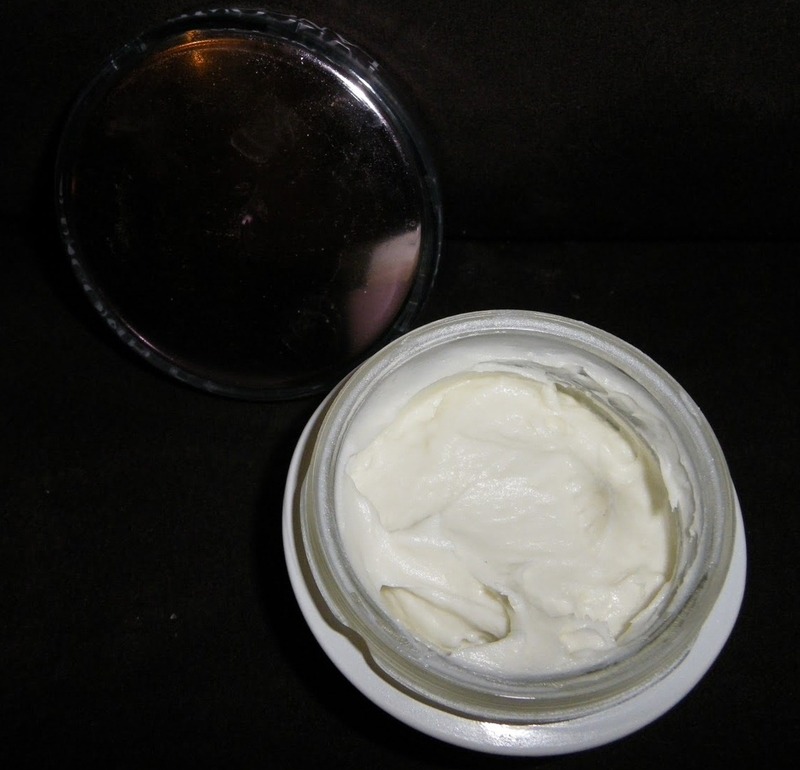 My lotion, for the first time making this recipe; I was happy with. The issue I need to solve for. Now is it feels a little grainy when applying and if i keep rubbing it in it does get better. I have no issue after a week of any seperation which I am very happy about. The look in a tub actually looks light and fluffy (guess I beat it up well). Do you have any advice on how to get the grainy feeling to be creamy? I soaked it for about 1 1/2 hrs. Maybe use my emulsifier on just the soaked lecithin first before incorporating the oils? Any help you can provide is much appreciated. Thanks for sharing your recipe’s! Hi Kathy, I am wondering, what feels grainy about it, if it is the lecitin, then try soak it longer apparently it didnt get dissolved completely. Also, mixing it with water prior to incorporating oils might help. Let me know!